The casual Civil War gamer frequently stays with advertised lines of ACW figures, ordering packs of specific ACW figures to fill out their armies. Armies often are boring, without a lot of variety in poses if the gamer sticks with one figure manufacturer or one line of castings. The veteran gamer often looks beyond the normal for figures from other periods / countries / wars that might work to add even more variety to the miniature Civil War army. These so-called “crossover” figures, while specifically made for one period, often can be converted or adapted for use for Civil War armies, often simply by varying the paint scheme or by modest conversions. Tom Dye from GFI is among the 15mm figure manufacturers whose figures are versatile enough to be used for multiple periods. For example, his Crimean War range includes a number of packs that are useful for ACW gamers looking for something a little different. The French Zouaves from this line are quite usable for ACW zouaves. The uniforms, headgear, and trousers are fine for most generic zouave regiments. Many of the castings have goatees and mustaches; it’s easy enough to add in full beards if desired. Another possibility is to use the Bergastraeli figures to represent the Garibaldi Guard (39th New York Infantry). These castings have round hats with ostrich plumes, matching the early war uniforms of this famed regiment. The line of Turcos figures can also be painted to ACW colors to add even more variety and color to the standard Civil War army. 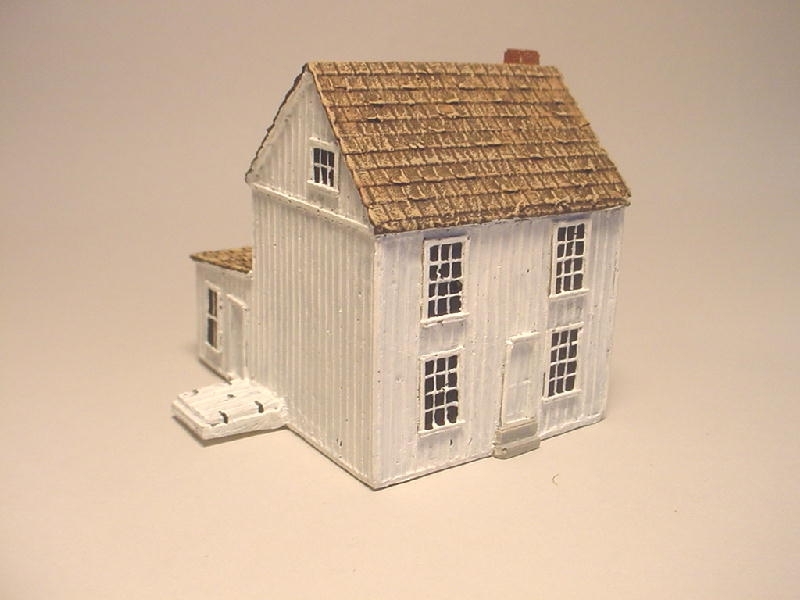 Have a look at Tom’s website and get creative in what you can do with adopting other figures for ACW usage. I found that certain 15mm AWI militia figures with floppy hats are readily usable as Confederates to again add more poses to an existing army, as are figures from other periods, including some colonial civilians. What “crossover” figures do you have in your armies? One of the Charge! blog’s readers e-mailed me asking about Johnny Reb players in the state of Colorado. If anyone in Colorado Springs, Denver, or elsewhere in the Rocky Mountain state is interested in another JR gamer joining them for recreational Civil War miniature gaming, please either e-mail me at scottmingus@yahoo.com or post a reply comment with your contact information. I will relay it to the interested person. I’m back in my hometown of Zanesville, Ohio, for the weekend. Dinner last night with some of my wife’s relatives, attending a wedding today for my nephew, and some other family get-togethers. Debi and I were born here and all of our siblings and both of our mothers all live in the vicinity. The town is perhaps best noted for its Y-shaped bridge, as well as being the home of western author Zane Gray. Zanesville has six ACW generals buried here, most notably Robert S. Granger who served in the western armies, fighting most notably in Kentucky and Tennessee against Joe Wheeler’s cavalry. Zanesville was a major recruiting and training center for southeastern and southcentral Ohio. Camp Goddard is today’s county fairgrounds. There is a direct connection with Gettysburg. Not far from the grave of another of my nephews is the plot of Lt. Charles E. Hazlett, a Zanesville resident who labored with his crew to haul his guns up to the summit of Little Round Top. Hazlett of course was gunned down there and, as he lay dying, was comforted briefly by General Weed, who also soon fell victim to a gunshot presumably from Devil’s Den. His brother John C. Hazlett also died during the Civil War, killed at Stone’s River. One of their relatives, Robert Hazlett, was among the most prominent riverboat captains on the Muskingum and Ohio rivers. There are dozens of the Hazlett clan buried in Woodlawn Cemetery, and descendants abound in the region. As Charles Hazlett moved off to LRT and his fate, he clasped hands with Major Charles H. Ross (MG James Barnes’ aide-de-camp), another Zanesville native and Hazlett’s boyhood friend. Ross’s great-great-grandson roomed with my son in college. Zanesville Post 81 of the Grand Army of the Republic was named in Hazlett’s honor. A city street is named Hazlett Court. Reader Nick Buxley of merry ole’ England contacted me. He is working with Eureka Miniatures of Australia to have them make a line of custom 28mm ACW figures for the Trans-Mississippi Theater. Eureka offers as “100 club” option where a wargamer such as Nick (or anyone else) can suggest a new addition to their current line-up of figures. If at least 10 other gamers from around the world show a marked interest in this new potential line, Eureka will advertise it on their website and invite pre-orders. If the pre-orders total 150 individual figures, then they will put the figures into production. Nick had noticed a gap in the 28mm marketplace for ACW figures for the Trans-Mississippi Theater (Quantrill’s Raiders, CSA infantry in battle shirts, local Missouri militia, Black troops, etc.) and wrote to Eureka suggesting these additions. Should any JRGS member or readers of this blog be interested in supporting his initiative and getting these figures into production, feel free to follow-up directly with Eureka. Follow this link to reach their 100 club and place your pre-order. As mentioned, these will be filled when the world-wide total hits 150 figures. Nick (and others) have reported to me that Eureka’s quality is quite good. Being a 15mm ACW gamer, I personally own none of their figures, but have seen them at Historicon and other conventions. They are indeed nice figures. So, please support Nick’s request should you be interested in Eureka producing figures for the Trans-Mississippi Theater! Leadership is a hard characteristic to measure and quantify, but no one disputes its importance and influence, whether in a military setting or in the business world, or even in families, churches, organizations, and schools. Good leaders are essential to provide goal setting, objectives, expectations of team members, decision making, strategy and pathways to achieve desired results, and modelling desired behavior and outcomes for their followers. Good leaders can often raise an average team or organization to greater results. By contrast, bad leaders can drag down the morale and performance of even good teams. The Civil War Battle of Gettysburg provided hundreds of examples of both good, effective leaders and those individuals who failed to rise to the challenge of leadership. In his new book Why You’re Already a Leader, author Paul Lloyd Hemphill examines 80 different situations at Gettysburg where people exhibited strong leadership in various ways, often rising above their own skills, background, and experience and inspiring others to new heights. Hemphill matches common traits found in strong leaders with their Gettysburg counterparts, examining how these characteristics were exhibited by soldiers and civilians at Gettysburg and how they relate to common challenges leaders face today in all walks of life. The practical examples and useful insights offer the reader some thought-provoking material to chew on; information and skills that will challenge the reader to determine is he or she would exhibit the same traits when under challenge or adversity. Hemphill’s writing style is lucid and succinct, and the rapid fire, short-bursts of information, examples, and applications can be read in small doses to allow the reader to dwell on each story and find practical self-applications. The book can be read in daily journal format, with one or two stories at a time to challenge the reader to excel and emulate the example. Some of the stories and characters are quite well known (John Burns, Winfield Hancock, etc. ), and others are common foot-soldiers or low ranking officers not familiar to many readers. However, their message and example shine through the years, offering opportunities for modern leaders to hone their skills. Why You’re Already a Leader, by Paul Lloyd Hemphill. 2007, One White’s Pond Press, ISBN 0978548213, Barnes & Noble and other leading retailers. Paperback, 243 pages. I just returned to Pennsylvania today from a business trip to Las Vegas, Nevada, a trip delayed for an evening in Chicago due to mechanical failure that forced a late change in planes. It was my first visit to Vegas, and I enjoyed seeing the sights and scenes. I do not gamble, so the casinos were of interest only as a spectator sport and for the shows and crowds. I did not find any wargaming stores of note, expecially with any significant quantities of historicals. Few Civil War things of interest, since Las Vegas was founded in 1905, but the New York, New York hotel does have a statue of a uniformed Thomas Meagher of the Irish Brigade. Appropriately, it stands in front of an Irish drinking house. Las Vegas’s Woodlawn Cemetery has two ACW veterans lying side by side, men buried in the 1930s. Ironically, one wore blue and one wore gray during the war. There apparently is a CWRT in Las Vegas, although I don’t know how active it is. Good business meetings, sunny weather (albeit 106 degrees! ), good food, an interesting side trip out to Hoover Dam on the Arizona border, and safe travels (although spending the might in Chi-town at a hotel near Midway was annoying as I wanted to get home)… all added up to a memorable first trip to Las Vegas. Seeing all the slot machines and gaming tables reminded me of just how glad I am that the recent Gettysburg casino proposal was rejected. We don’t need this sort of entertainment near Gettysburg, and routes 15 and 30 are already way too crowded in the summertime. A casino would only add to the traffic situation. “No Casino Gettysburg” was definitely the right movement with the right results. Let’s hope we never see a casino in this part of once rural and scenic south-central Pennsylvania! What area attractions do you like best in Las Vegas? Most of you regular readers know I am a native of southeastern Ohio (Zanesville to be specific, about an hour east of Columbus). I spent a lot of hours in the state capital over the years and have been interested in regional Civil War history all my life. My parents used to regularly send me newspaper clippings for ACW events and articles. Here is one anecdote I particularly like, which I adapted from a column by John Switzer in the April 17, 1996, Columbus Dispatch. Camp Chase (named for Salmon P. Chase) was one of Ohio’s largest prisoner-of-war camps. The sprawling camp along today’s West Broad Street was used early in the war as a training grounds for newly recruited Ohio regiments, but sections of Camp Chase had been transformed into a prison once the numbers of Confederate prisoners began escalating. On June 7, 1862, Federal authorities held a ceremony commemorating the erection of a gigantic flagpole. Two huge trees were spliced together to form a 150-foot high wooden pole that could be seen for quite some distance. A hand-sewn 42’x27′ American flag proudly flew from the lofty pole. Dignitaries, politicians, military officers, and leading citizens were all present, along with Governor David Tod. Bands played patriotic airs, speeches were given, and the mood was light. At last it was time for the camp commander, Col. Granville P. Moody of the 74th Ohio Volunteers, to stand and deliver his speech. The Methodist minister, known affectionately as the “Fighting Parson,” electrified the boisterous crowd with his final comments, “In the name of God and Governor Tod, we’ll follow our flag to Dixie!” The crowd erupted in cheers and applause, except for the penned up Rebel prisoners not far away. Days later, strong winds toppled the upper portion of the flagpole, causing the huge banner to crash to the ground. Seeing the flag lying ingloriously in the dirt, the entire Confederate population of 9,000 prisoners erupted in their own cheers. Many danced and laughed and pointed at the fallen Old Glory. Shouts of “Hurrah for Jefferson Davis and the Confederacy!” rang out throughout the compound. Some prisoners proclaimed it was a portent or sign that the North would end up the same way – fallen and disgraced, toppled in wreckage. God was on surely on their side, and “the whirlwind of heaven had joined them in warring against the Stars and Stripes.” Riotous prisoners crossed over lines they had been forbidden to cross within the stockade. Colonel Moody called out the guards, who leveled their muskets at the crowd and threatened to open fire if they did not disperse. After further threats, order was finally restored. The flagpole was repaired and Old Glory again floated over Camp Chase, much to the chagrin of the Rebels. Ironically, Moody’s wife hailed from Virginia, as did her parents and relatives. Moody’s brother George was a Confederate captain who commanded a Louisiana artillery battery in Robert E. Lee’s Army of Northern Virginia. At Gettysburg, Captain Moody’s CSA gunners played a prominent role under E. P. Alexander in the famed artillery bombardment that preceded Pickett’s Charge. The Hanover Junction, Pennsylvania, train depot here in York County played an important role during the Civil War. The hamlet and the small wooden three-story depot sat at the intersection of the Northern Central Railway (the main link between Baltimore / Washington and Harrisburg, the capital of the North’s second largest state) and the Hanover Branch Railroad, which ran westward to Hanover, where it continued on to Gettysburg as the Gettysburg Railroad. The station house served as a regional training center for young apprentices learning the telegrapher trade and, during the Gettysburg Campaign, served as an important relay station for messages concerning military movements. The nearby railroad bridges were all burned during the campaign, telegraph wires severed, rails lifted, rolling stock and turntable burned, switches destroyed, and other damage inflicted, all by the 35th Battalion, Virginia Cavalry. However, within days of the Battle of Gettysburg, Herman Haupt and the US Military RR had restored service and carloads of wounded from Gettysburg were transferred through Hanover Junction to Baltimore, Washington, Harrisburg, York, Philadelphia, and other cities. Among the thousands of wounded who temporarily lay in the fields and pastures in the valley near Hanover Junction awaiting their north-south trains was Maj. Gen. Daniel Sickles of the III Corps. In November, President Lincoln changed trains at Hanover Junction en route to Hanover and Gettysburg to deliver his Gettysburg Address. He returned via the same route and again spent a little time in the station house. A photograph of a group of dignitaries traveling to the National Cemetery dedication ceremonies may show Lincoln, although most scholars question the identification. The depot museum has a blow up of the photo for visitors to make their own judgements. The Hanover Junction station house was restored in the early 2000s and is open to the public on summer weekends. It features a small museum. The route of the Northern Central Railway is now a paved bicycle path alongside the tracks (trains no longer are operational). A historical marker commemorates Lincoln’s visit. Today is June 6, 2007, the 63rd anniversary of D-Day. Hundreds of veterans of the Normandy invasion, perhaps thousands, have died in the last couple of years. Among them is my beloved Dad, Staff Sgt. Robert E. Mingus, who died in 2005. I happened to be back in Ohio on business this week and took a side trip last night to spend some time at his gravesite. My sister gave me a suitcase she found with some more of his personal possessions, including some WWII items. Those of us in today’s generation cannot begin to grasp the enormity of what it took to plan and execute the Normandy campaign. Sure, we have Saving Private Ryan and similar war movies, but they are Hollywood recreations that can never pretend to capture what it wa really like, according to many vets who were there. To Dad and the thousands and thousands of others who participated in the liberation of France and the subsequent drive into Germany, thank you.